The Michigan Economic Activity Index consists of eight variables: nonfarm payrolls, exports, hotel occupancy rates, continuing claims for unemployment insurance, housing starts, sales tax revenues, home prices, and auto production. All data are seasonally adjusted, and indexed to a base year of 2008. Nominal values have been converted to constant dollar values. Index levels are expressed in terms of three-month moving averages. Only two out of nine index components were positive in July, industrial electricity use and state sales tax revenues. The nonfarm employment sub-index was unchanged for the month. Initial claims for unemployment insurance, housing starts, house prices, vehicle production, state trade and hotel occupancy were all negatives in July. Monthly job growth in Michigan has stepped down this year. In 2016 the state averaged a net gain of 7,700 jobs per month. Through the first eight months of 2017, the average has dropped to 3,000 net new jobs per month. The rapid rebound in manufacturing employment following the Great Recession has likely played out. Going forward, we expect to see flat to declining manufacturing employment, consistent with a mature business cycle and ongoing productivity gains for the state’s industrial base. Bank officials said the index has not shown consistent momentum, failing to put together back-to-back monthly increases for all of 2017. They said the state economy could get a temporary boost from auto production this fall as households and companies along the Gulf Coast replace vehicles that were flooded out from Hurricanes Harvey and Irma. However, the long-term outlook for vehicle production still calls for gradual declines over the next year despite the temporary boost to demand this fall. July’s reading is 21 points, or 21 percent, above the index cyclical low of 97.9, reached at the bottom of the last recession The index averaged 117.1 points for all of 2016, one and four-fifths points above the index average for 2015. June’s index reading was 118.6. 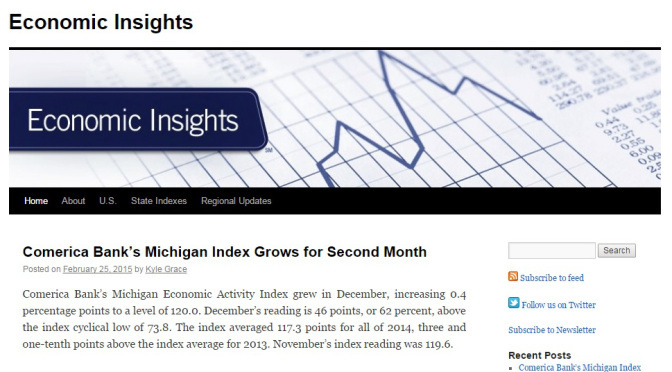 To subscribe to Comerica economic publications, email ComericaEcon@comerica.com. Archives are available at www.comerica.com/economics.